There's hope for healthier sunscreens! Conventional sunscreens often contain a plethora of toxic ingredients we don't want on our skin. Luckily, natural spf oils are becoming more mainstream as a way to gently and lightly protect your skin from the sun's harsh rays. I work from home a couple of times a week, and when I do, I’m rarely outside during the day for more than 20 minutes at a time. Despite that, I consider SPF an integral step in my routine, especially now that I’m a bit older. At the same time, I don’t want to lather on sunscreen since I’m primarily inside but I also don’t want to wear long pants and a long sleeved shirt to take my dogs out for a quick walk. Enter skincare and body products that contain oils which provide natural SPF protection from the sun. There are several natural oils that can add an extra layer of protection from the sun's powerful rays! Carrot seed oil has significant antioxidant, antiseptic, antifungal and fragrant properties with high levels of vitamin A. This normally comes in the form of an essential oil, but when mixed with a carrier oil, provides sun protection as high as SPF 38-30. Raspberry seed oil is a great source of Vitamin E and polyphenols, which protect from UV radiation, help regenerate skin and promote elasticity. One study concluded that raspberry seed oil is comparable to protection provided from titanium dioxide, and has a natural SPF of anywhere from 28-30 depending on the quality of oil, making it definitely one of the best spf oils. Wheatgerm oil is a great source of Vitamin E, K, and B and Choline. This is fantastic for moisturizing tissue and preventing free radical damage. The SPF rating of wheatgerm oil comes in around 20. Avocado oil has a high proportion of mono-saturated fats, which provide a protective layer over the skin. This ranks in as high as SPF 15. Pomegranate seed oil is another excellent source of polyphenols and rich in Vitamin C, which helps fight free radicals. A study conducted in 2001 from Cosmetic Dermatology showed that when mixing pomegranate seed oil into a traditional sunscreen, it boosts the effectiveness of UV protection by 20 percent. Coconut oil, jojoba oil, macadamia nut oil, olive oil, almond oil and others also will provide some natural protection, but come in at less than SPF 10. While they are great ingredients to have in a product, they will not provide any kind of suitable protection from the sun. To that point, you should always wear traditional sunscreen or a tinted SPF if you’ll be spending significant time in the sun. These are all great options for grey, rainy days, or when you will be outside for short bursts of time. I consider them great additions to my tinted moisturizer or sunscreen or products in general, as not only will they provide an extra layer of protection, but they will also help in nourishing the skin, feeding it with antioxidants and vitamins, and regenerating cells. Some of Argan Republic’s products that contain these amazing, naturally protective oils. Both of these body oils are lightweight and fast absorbing, perfect for wearing under makeup for extra sun protection. Benefits: We formulated our two sun protection oils with the philosophy that your skin should be conditioned(not congested!) while shielding it from harmful UV rays. This oil is for day to day wear while you're on the go, not intended for use under prolonged exposure to sun. It's not a substitute for sunscreen, but rather a way to naturally boost your sun protection in cases when you might not normally wear any sun protection at all. Wear it with or without makeup on your face or body for a sun-kissed glow. Apply after sun exposure to heal, soothe and regenerate damaged skin, sunburns or dry spots. Neither carry an SPF rating, but are packed it with organic oils like raspberry seed oil and macadamia nut oil, that naturally protect your skin from UV rays and also prevent damage, heal and regenerate skin cells. Benefits: Argan Republic's Youth Elixir anti-aging serum is an amazing, concentrated blend of 16 of the finest, most exotic and skin nourishing oils. 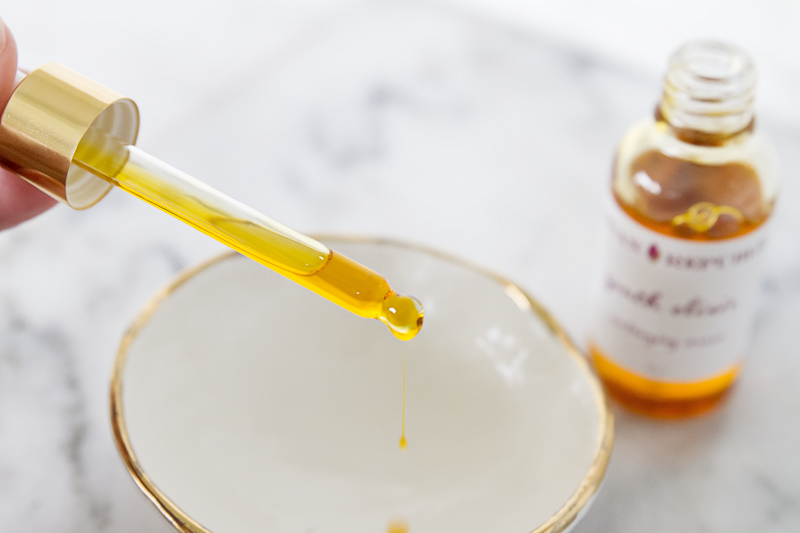 With a 25% argan oil base, we've added organic and wild crafted oils with a 0-2 comedogenic(pore clogging) rating . I've also selected the most skin-loving, naturally aromatic essential oils. This elixir deeply penetrates skin, absorbing easily, leaving your skin quenched and nourished. It balances skin moisture levels, smooths lines and wrinkles, helps with skin cell regeneration, treats acne, combats free radicals, restores elasticity, reduces inflammation, repairs skin, reduces stretch-marks and skin pigmentation and helps reverse & prevent UV damage for a youthful appearance. This serum literally does it all and will target all skin problems. About the Author: Stephanie G. is the founder of All about that glow, a beauty blog dedicated to natural skin care.